How can you use crowdsourcing on social media? We'll share 5 ways you can do so. You know what they say, two brains are better than one. Imagine this then, tens and thousands of brains doing the thinking and all of the ideas laid out like a buffet spread. Go on, pick and choose that which fit your fancy, because you’ll find it littered with ideas that range from brilliant to downright puzzling. That’s a bit like how it is with crowdsourcing, and if you harness it right, it could work to your advantage. Let’s find out how you can crowdsource your social media. Sometimes all you have to do is ask people for their feedback. Keep the question simple, with a yes or no answer, A, B or C option, preferably with images to support your question. It helps to throw in a prize, which could be in the form of your product or the service you’re offering. Make sure that it is something of value to the respondent, or your effort will be in vain. If you have more than one question to ask, why not run a survey. You stand to gain much more insights into your customers’ thoughts and that could serve as valuable information to help you market your product better. Again, throwing in a carrot could motivate better response. In return, your customer would feel that you value their feedback. Throw in some fun and games in the form of contest. Make the announcement early to alert your audience so they’ll keep an eye out for it. Leverage on their participation by asking them to tag their friends, giving you additional exposure at no cost! If you have the budget, advertise it because contests are often found to have higher engagement rate. What could be more interesting than watching paint dry? How about puddle watching? You would wonder how on earth something as mundane as a puddle of water could turn conversation frenzy, but that’s exactly what happened with the #DrummondPuddleWatch at Newcastle, England. Keep your eyes open, and don’t be so quick to dismiss what could become the next internet viral. 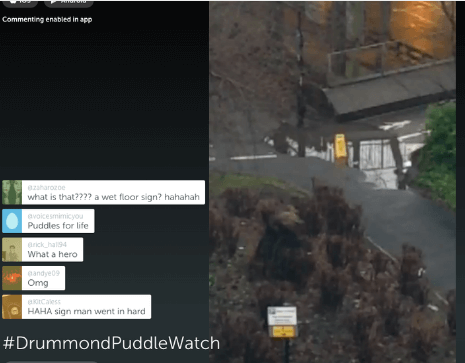 Some guy at the nearby office started the #DrummondPuddleWatch frenzy by streaming it live on his Periscope. There are key opinion leaders and influencers whom your audience listen to and follow. Why not leverage on their ‘fan base’? As long as the influencer’s area of interest is aligned with your products, you immediately gain access to a pool of potential buyers. Follow the influencer, reach out to them and have a genuine interaction with them. Do it right, and not only will the influencer take notice, so too will the followers. Have you started to leverage on crowdsourcing for your social media? if you haven’t, this is a good time to start!